Henry Ford Hospital President and CEO Dr. John Popovich, Jr. interviews Dr. Steven Kalkanis in the latest edition of “Interviews in Front of the Living Wall: Legends Interviews.” In this segment, Dr. Kalkanis, Chair of the Department of Neurosurgery at Henry Ford Health System and Medical Director of the Henry Ford Cancer Institute, discusses advances in neurosurgery, the future of the Henry Ford Cancer Institute and more. 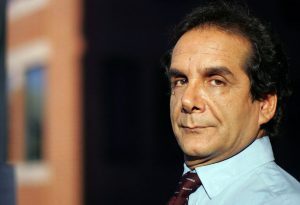 “I also love the style of fellow physician and far superior writer, Charles Krauthammer, whose decades-long columns, largely for the Washington Post, are compiled in the book “Things That Matter: Three Decades of Passions, Pastimes and Politics” (2013). My statement about Charles Krauthammer was a significant underestimate of the incredible esteem that I held for this man. I read him religiously, his column in the Washington Post was a must for me to read. Not for the politics and not entirely for the intellectual challenge that he provided. It was his civility, respect, and his ultimate love of life. Re-reading his columns this morning, I could not help to climb aboard his literary roller coaster: laughter, tears, reflection. The kind of columns you read to others. The kind of words you wish you could write yourself.